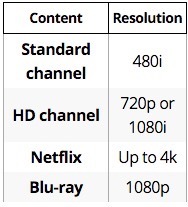 What is 1080p, 720p, 480p? The “p” refers to the number of lines of resolution (progressive) in a TV screen. So, the more lines, the sharper the picture is. There are horizontal and vertical lines of resolutions per below. Blu-Ray’s are distributed natively in 1080p. 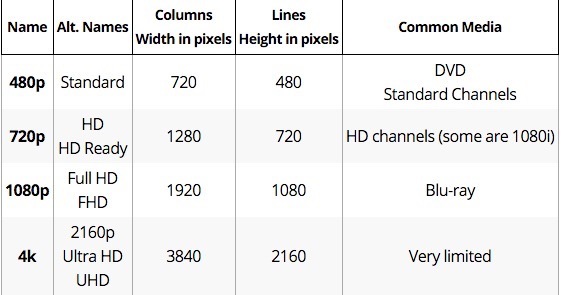 720p is still HD, and is commonly used to maintain the same quality of video (generally), but drastically reducing the file size by nearly half in most cases. So, a true videophile won’t typically reduce from 1080p if they are looking for true “lossless” video. Not everyone has $ for terabytes of storage, so 720p is much more viable ripping and storage option for consumers. Download and use Make MKV that will rip your DVD/Blu-Ray in raw form – meaning it will copy exactly the quality from your disc. After the copy, we will shrink the file size down to something manageable for storage. After ripping, you will have a single, large .MKV file. We will use Handbreak to convert the .MKV file now. 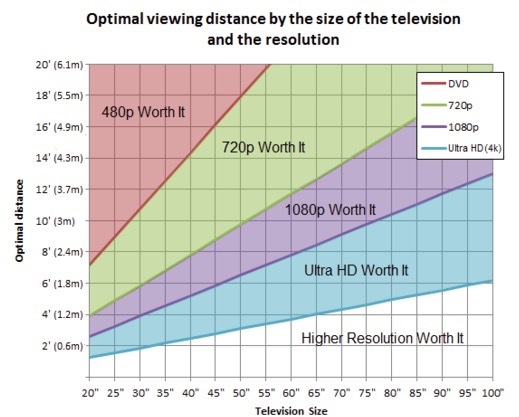 You must decide whether to keep 1080p or downsize to 720p. This is an important decision. You will want to keep true 1080p for more action intense films – since these offer incredible detail. You might not want 1080p for a comedy film as there’s not much to focus on other than people talking. The difference in “p” here is minimal, but it is your choice. In this example, we will convert to 720. In Handbreak, open the .MKV file. Choose Picture Settings” in top right menu bar. Here, set to “anamorphic” and the width to 1280. Next, select Toggle Presets to reveal a sidebar window. Then select High Profile per below. Select MKV File as it’s going to be the most compatible video file format now. Choose the Quality of the video encode. Use constant quality as this will be most reliable for predicting the size of your file. A good RF quality for Blu-Ray is between 18-21. The lower this value, the better the quality from the original. This will be the main factor for driving your video file size – so experiment with different values. Select the audio tab. For audio, select AAC Passthru. This codec reduces file size and keeps nearly the same saturation of sound from source. For lossless audio, you could choose AC3. Every result varies. Share your results here – and let us know your “sweet” spots for DVD/Blu-Ray ripping!